My name is Thersa Matsuura and I am the author of two short story collections. The second one (The Carp-Faced Boy and Other Tales) was a finalist for The Bram Stoker Award (2017). I'm a Clarion West ('15) graduate, Mary Wollstonecraft Shelley Scholarship recipient, and a podcaster at Uncanny Japan. What I want to do is introduce you to parts of Japan your probably don't know about. I want to show you all the cool, weird, creepy stuff, the uncanny. I'm an American expat writer who has spent half my life in a small Japanese fishing town. And by 'small fishing town' I mean a place where every day it feels like I'm stepping back in time. This is old Japan where the line that divides myth from reality isn't just blurred it's nonexistent. Superstitions and legends have been passed down for generations, and they continue to affect daily life. This is a culture where I had to change the floor plans to my house because the kitchen door was sitting in a northeast direction – also known as the Kimon or Devil's Gate – and would surely invite rancid luck into my home. It's a society where one day, apropos of nothing, my mother-in-law declared me "sticky" and insisted I have an exorcism because I attract ghosts. This coexistence of ancient and modern has fascinated me for the past twenty six years, and I’ve used my fluency in the language to study the parts of Japan which have yet to be revealed to Western audiences. My relatively new, monthly podcast – Uncanny Japan – is where I share these odd bits of research. What makes my podcast different is that I record them while wearing binaural mics. This means that as I sit by the shore, hike through the mountains, or even watch a local festival, you'll be with me, learning about Japan, and experiencing the soundscapes exactly as I do. I adore making postcard-sized pictures depicting all the strange creatures and beautiful characters of Japan. 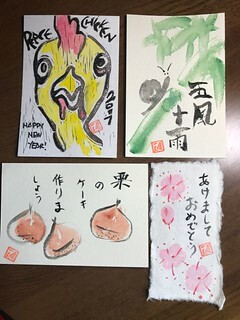 These days I do hanga carvings, brush and inks, or Japanese etegami-watercolors. These will be available in the Rewards section. Below are a few of my creations. Dearest to my heart is the writing: my short stories and novels. Here is where I combine all of my research with my 26-years of living in Japan and weave you a tale. (See below for my already published and soon-to-be-published works). Your pledges through Patreon and engagement as readers and listeners will provide me the support to pursue my passion for creating art: recording my podcasts, painting freaky postcards, and writing dark, uncanny stories and novels. You help me, and I promise to use these three mediums to introduce you to all the weird secrets lurking in the nooks and crannies of Japan. * Graduate of Clarion West (2015). * Recipient of HWA's Mary Wollstonecraft Shelley Scholarship. * Author of A Robe of Feathers and Other Stories (Counterpoint LLC, 2009). * My second collection –The Carp-Faced Boy and Other Tales– (Independent Legions Press, February 2017). * My retelling of the Japanese horror tale, "The Wife Who Didn't Eat" appears in the A World of Horror Anthology. ※I'm using the charge up front method, where new Patrons will be charged when they join and then at the beginning of each month. I'm guessing this means if you want to become a Patron later in the month, it might be a good idea to wait until the first of the next month so you won't get charged in quick succession. Thank you! ⭐️Access to my Patreon only feed (chatty stuff and sneak peeks into what I'm working on). ⭐️I'll also upload some of the background binaural/3-D soundscapes from time to time. Rain. Frogs. Walks by the ocean. A stroll through Kyoto Station. I hear they're wonderful to listen to while working, studying, or chilling. ⭐️All Patrons who send me their address will get an Uncanny Japan sticker. ⭐️ Of course, access to my Patreon only feed (chatty stuff and sneak peeks into what I'm working on). ⭐️Plus a once-a-month Bedtime Story. This is either some obscure Japanese folktale I translate, retell (reimagining when necessary), and record with cool background music. Or instead of my own retellings, I'll read some other Japanese fairytale that I think you might find interesting. ⭐️Also included for Kitsune on up will be the occasional meta podcast. This will be me and my sound/tech guy discussing various aspects of the show as well as all the nitty-gritty stuff about living in Japan, things that only long-time expats (we both have lived in Japan since 1990) know. A few drinks might be involved. ⭐️Let's not forget the occasional binaural soundscape (minus the podcast) for you to listen to at your leisure. Take a 3D ride on a local train, a walk by a frog-filled rice field, a stroll through Kyoto Station and more with me. ⭐️Finally, if you join and you'd like any or all of the past Bedtime Stories, let me know. I'll pass those MP3s along to you as well. Thank you and domo domo! ⭐️ You will also get a monthly postcard hand-made by me. 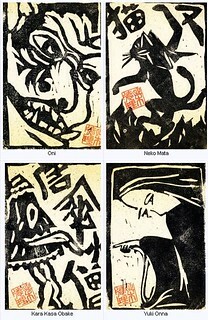 Depending on my mood, I'll paint, water color, brush and ink, or make a hanga-carving depicting something Japan related. Nothing is off the table. I'll go where the muse takes me. You can see a handful of my past creations on my Overview page. Please allow me to be weird. ⭐️A monthly "care envelope" filled with odd items I stumble across here in my Small Town, Japan. I'll include anything I think you might like: sweets, stationary items, trinkets, and charms. Every month will be a surprise. Note: No postcard -Kappa- for this reward. Thank you and kansha shitemasu! ⭐️Then, on top of that, twice a year I'm going to send you a care package, a level up from the monthly envelopes. I'll email you and find out what corner of Japanese culture you're interested in, so the package will be something hopefully dear, just for you, and something you can't get where you happen to be in this world. Thank you and hontou ni kokoro kara arigatou gozaimasu! Life got weird and I got a full-time day (sometimes night) job. I have a dream and it involves doing what I do (teaching), but not to the degree that I am unable to write stories and do podcasts. Who am I kidding? All I want to do is research and create, write stories and tell stories and keep Uncanny Japan going. Right now my Patreon money goes back into the podcasts, purchasing better mics and recording software/equipment, as well as giving what's left over to my Tech Guy who does so, so much for free. If I can meet this goal of $1,000 per month, I will be able to pay Tech Guy what he's worth as well as possibly cut down on some classes to allow me time to devote to the content of these shows, on my writing and and on my whacky art. Shhh...and the Big Dream: One day I'd love to be able to spend a year and travel down the length of Japan, researching, photographing, and writing about as much Japanese folklore, yokai, and myth as I can get my hands on.